Cushion cut vs. princess cut diamonds: which of these fancy shapes is best? Both cuts are popular, which can sometimes make the decision difficult. 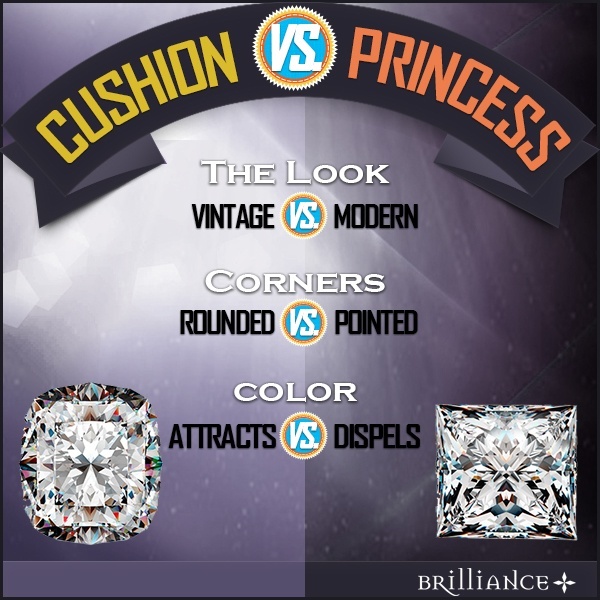 At the same time, there are some important differences between cushion cut and princess cut diamonds. Here, we’ll explore these beautiful gemstone shapes in order to help you make a more informed decision. Whether you are exploring your options while shopping for a cushion cut or princess diamond rings, or comparing several different shapes, you’ll find this guide is a useful one. The cushion cut has been popular for more than 100 years, making it an outstanding choice for vintage-inspired engagement rings. Sometimes called pillow cut diamonds, cushion cuts have large facets that increase their brilliance and highlight the stone’s clarity. When comparing cushion cut and princess cut diamonds, one of the first things you will notice is that cushion cut stones have gently rounded corners. These stones are often square, however they are available in a variety of rectangular shapes. The longest rectangular cushion shaped diamonds have a very elegant, almost oval appearance. If you prefer the square cushion cut, look for a stone with a length to width ration between 1 and 1.05. If you prefer the longer look of a rectangular cushion cut diamond, look at stones with length to width rations between 1.15 and 1.30. Need diamond advice? Call 866-737-0754 to speak with a diamond expert. The princess cut is a modern favorite for engagement rings; in fact, it is nearly as popular as the traditional round brilliant cut. This diamond shape has pointed corners, and it often offers a symmetrical, square profile. 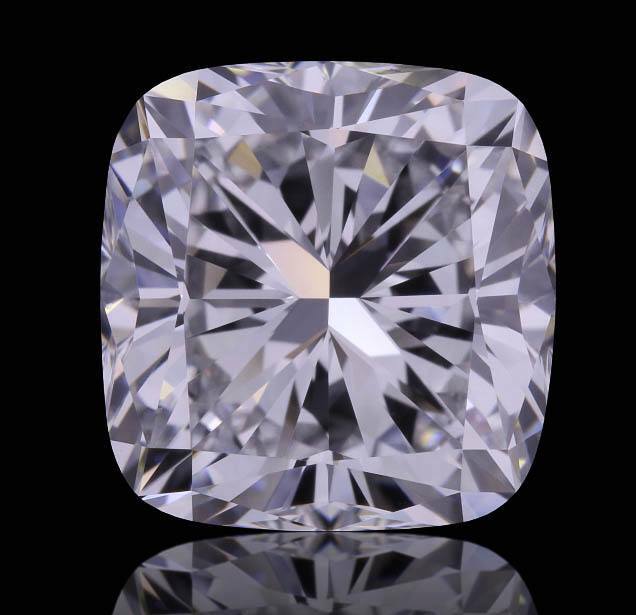 That profile can change slightly depending on the diamond’s length to width ratio; where a 1.0 is perfectly square, a 1.2 princess cut diamond has a slightly rectangular shape. If you prefer the square look, consider a stone with a length to width ratio between 1.0 and 1.05. If you find the rectangular profile more attractive, look for a stone with a length to width ratio of 1.10 or higher. When comparing cushion cut vs. princess cut diamonds, you’ll notice that the two shapes offer a distinctly different sparkle. The cushion cut has a softer gleam that some people compare to sparkling water or crushed ice. The princess cut typically has a brighter sparkle. Of course, it’s important to remember that each diamond you look at is going to have its own brilliance and fire. Much depends on the stone’s quality in terms of color and clarity. Both princess and cushion cut diamonds look fantastic in solitaire or halo settings. If you’re looking for a three-stone ring, you might find that the princess cut is best. The stones have perfectly straight edges that create a beautiful, symmetrical look. At the same time, a three-stone ring with a cushion cut diamond at its center and trillion or round side stones can have an interesting vintage appearance. Whether you are comparing cushion cut vs. princess cut engagement rings or shopping for other types of diamond jewelry, be sure that you look at several examples before making your final decision. The two styles offer distinctly different looks that appeal to different tastes and fit well in a variety of settings. The Look: Modern – Traditionally square, but can have a rectangular profile. Number of Facets: Depending on the pavilion design, the number of facets varies. 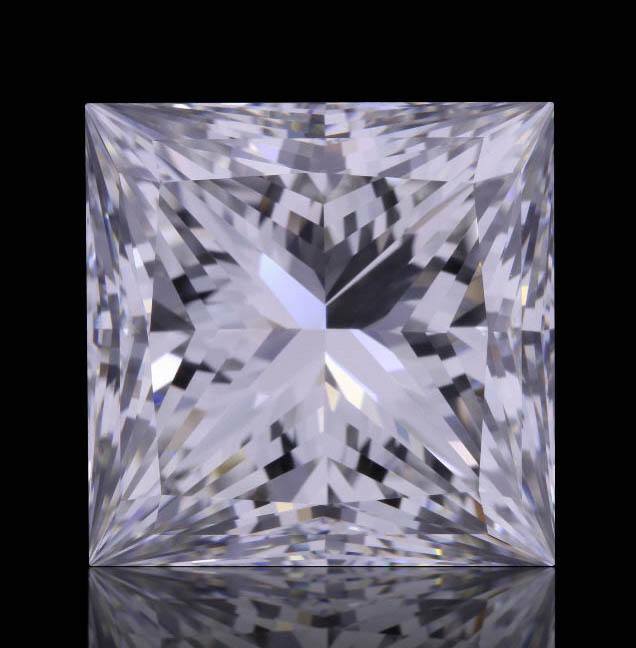 Some princess cut diamonds have 50 facets, while others have 144. Color: Color is most evident at the corners of the stone. This is a highly subjective factor and many colors are acceptable. Warmer G-H colors (GIA certified)* are sometimes desirable. Clarity: The princess cut is a fairly forgiving one that can hide inclusions. Carat: Measurements can vary quite a bit from one weight to the next. The emphasis should be placed on the measurements (length x width) rather than the carat weight since that will determine how big the stone will look. Dimensions: If you prefer the square look, consider a stone with a length to width ratio between 1.0 and 1.05. If you find the rectangular profile more attractive, look for a stone with a length to width ratio of 1.10 or higher. *Learn more about certified princess diamonds here. Created: In the 1830’s-rooted in mining history. The Look: Vintage—character-rich antique look. Color: Attracts a lot of color. We recommend no lower than a J color (GIA certified) or G color (EGL certified). Clarity: With its respected faceting, we recommend no lower than an SI2 (GIA certified) or VS2 (EGL certified). Dimensions: When selecting a square shaped cushion, look for a length-to-width ratio between 1 and 1.05. For those who prefer a rectangular shaped radiant, choose a length-to-width ratio of 1.15 or greater.